Location: At the end of the McCarthy Road into Wrangell-St. Elias National Park. There is no vehicle traffic beyond the Kennicott River footbridge at McCarthy, five miles from Kennecott. In the summer there is shuttle transport between the two locales, but in winter the only access to Kennecott is by hiking or skiing from the end of the McCarthy Road. The ghost towns of Kennecott and McCarthy sprang up in the early 1900s after the discovery of the world’s richest concentration of copper ore. Kennecott quickly became the most modern city in Alaska, boasting running water and a hospital at a time when Anchorage was populated with tents and by 1911 the mine was connected to Cordova with the 196-mile Copper River and Northwestern Railroad. Abandoned abruptly in 1938 when high-grade ore played out, many of the buildings and equipment stand as they were on that last day, leaving a living history of those rugged days of high adventure. The National Park Service acquired Kennecott National Historic Landmark in 1998 in order to preserve the structures and guided tours of many of the impressive mine buildings are available, including the massive 14-story ore mill. The Kennicott Glacier Lodge is located near the center of the 40 remaining structures in Kennecott, overlooking 25 miles of glacier and surrounded by many of the highest mountain peaks on the continent. 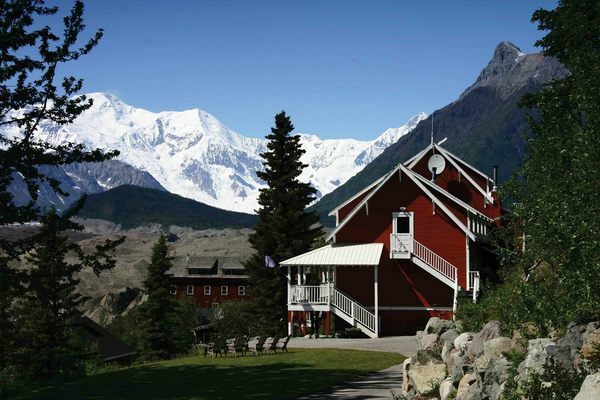 The lodge offers gracious hospitality and breathtaking views, and can help arrange for easy glacier hiking, ice climbing and instruction, alpine hiking, mountain biking, rafting and spectacular flightseeing. The historical towns of Kennecott and McCarthy are located 4.5 miles from each other in the center of Wrangell St. Elias National Park and are notable as two of the most well preserved ghost towns in America. Kennecott was the quintessential “Company Town” and McCarthy was a fully realized “Sin City.” These towns were inseparably tied together back in the copper mining days and they are still inseparable today. 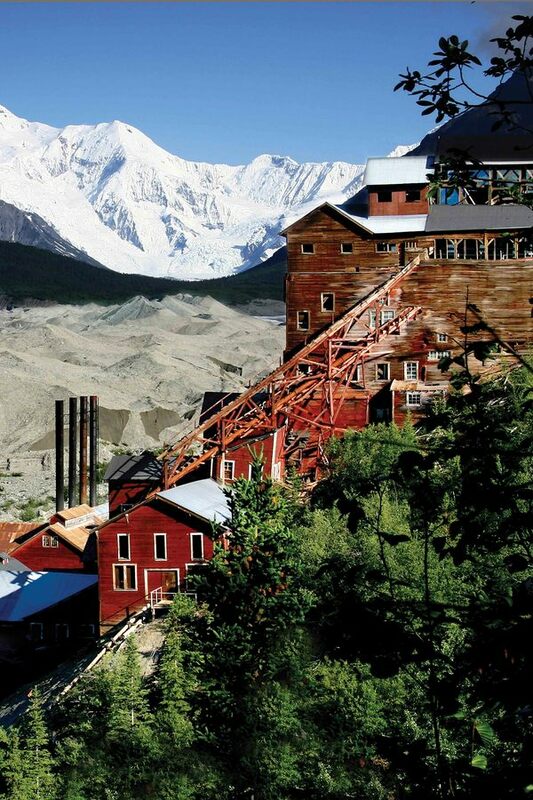 Kennecott is where you will want to spend the day exploring the town and hiking on the glacier. The National Park Service has done remarkable work in preserving and protecting this amazing historical site. McCarthy is where you will want to spend the nights celebrating at the Golden Saloon, enjoying an exceptionally fine gourmet dining experience at the McCarthy Lodge, or just sitting on the porch of the Ma Johnson’s Hotel watching the town go by. At one time in history McCarthy was the largest city in Alaska. There was every luxury you could imagine available in this remote outpost, including a dressmaker’s shop, several hardware stores and many “fountains and pool halls” – the perfect place to get a drink during prohibition. A locally owned company has been busy restoring much of the downtown since 2001 and the owners are dedicated to the preservation of the area. Many of the McCarthy Lodge staff live here year around and love to share the town’s history, stories and lifestyle with their guests. One of the most unique aspects of McCarthy is that it is the very last intact bush community still located inside a National Park. 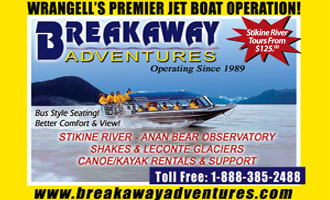 There are many things to do in Wrangell St-Elias, especially for the adventure-seeking traveler. Scale a few mountain peaks, hike across one of the 150 glaciers or explore an ice cave with one of several experienced guide companies. Alpine hiking is a very popular activity and many possibilities abound in this portion of the park, including trails above the Kennecott Mill Site. You can also be flown out to any number of alternative destinations for a trek lasting from a few days to several weeks. Some hikers take the glacial crossing in front of Kennecott across the Root and Kennicott Glaciers, then cross over to Donoho Mountain for backcountry camping. There are several rafting options for every experience level, from 8-person inflatables to pack rafting the wild rivers of the park. Encompassing over 13 million acres, Wrangell-St. Elias is known as “America’s Mountain Kingdom” with more mountains, glaciers and wildlife than anywhere else on earth. The Park is crossed by four mountain ranges and its coastal mountains are the world’s tallest; in fact, over half of North America’s 16 tallest peaks are right here. This is also where you’ll find the largest glacier outside of the polar caps, and one of only two glaciers in the world with a forest growing on top of it. Driving or flying into the heart of Wrangell St. Elias National Park to McCarthy and Kennecott? Looking for options on driving yourself in? Whether self-driving, using a van shuttle service or an air taxi, plan your trip carefully. You will want to spend a few days in McCarthy and Kennecott to fully experience America’s largest National Park. The McCarthy Road is a challenging 60-mile stretch. Staying at or below the 30 mph speed limit is essential to safety, so plan on a two-hour trip. The good news is the road is one of America’s Great Drives. From Chitina, you enter through a short split-rock ‘tunnel’ and from that moment on the views are world-class all the way to McCarthy. One of Alaska’s most scenic backcountry roads, it is famous for many unusual sights including the Galhina Trestle and the Kuskalana Bridge. 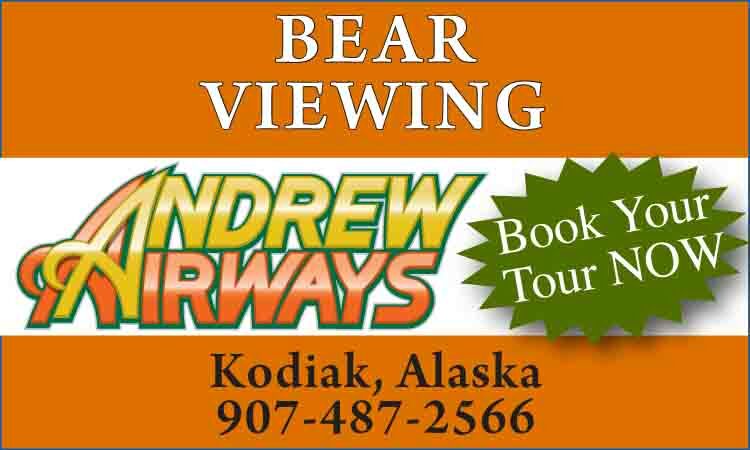 It is possible to view Alaska Dall sheep, mountain goats, moose, black bear, grizzly bear, fox, wolverine, tundra swans and other waterfowl along this route. If you’re an avid fisherman there are many lakes available from Glennallen to McCarthy for trout, salmon and burbot. You will be driving along the route that was previously the train-track bed for the CR&NW Railway. The McCarthy Road use to be famous as the worst road in America. After over a decade of much improvement and hard work, the first third is now hardtop and the last 40 miles are still gravel. What you aren’t likely to see any more is a railroad spike, something that destroyed a fair number of tires over the years prior to their removal several years ago. Alaska’s Department of Transportation has made enormous progress in keeping the road in excellent shape through the summer months. About 90% of the approximately 40,000 people who visit Wrangell-St. Elias each year choose to drive the McCarthy Road. Not all car rental companies allow their cars on the McCarthy Road. Budget, Levi’s Car Rental and Go North Alaska Travel Center have agreements with McCarthy Lodge, so that when you stay with these folks the gravel road restriction is waived. There is no cost for this waiver, but it only applies when you have an advance reservation at McCarthy Lodge or Lancaster’s Hotel, located in the center of McCarthy. A-1 Car Rental in Anchorage has also been allowing their vehicles to travel the McCarthy Road. Kennicott Shuttle also offers daily service from the Copper Basin to McCarthy. When you get to the end of the road, take the footbridge and follow the trail to McCarthy, one mile down the road. Shuttle buses are available at the footbridge. Ma Johnson’s Hotel guests can call the hotel from the free phone at the footbridge and they will pick you up. Road conditions can be verified by contacting the Alaska Department of Transportation or the Convention and Visitors Center in Glennallen at (907) 822-5555. Driving speeds of no more than 30 mph are recommended. Some tire repair service is available in the McCarthy area during the summer months. Be prepared with a good spare tire just in case. Shuttle van service is another great option for visiting McCarthy and Kennecott. www.alaska-backcountry-tours.com will take you over the McCarthy Road from Chitina or Glennallen. 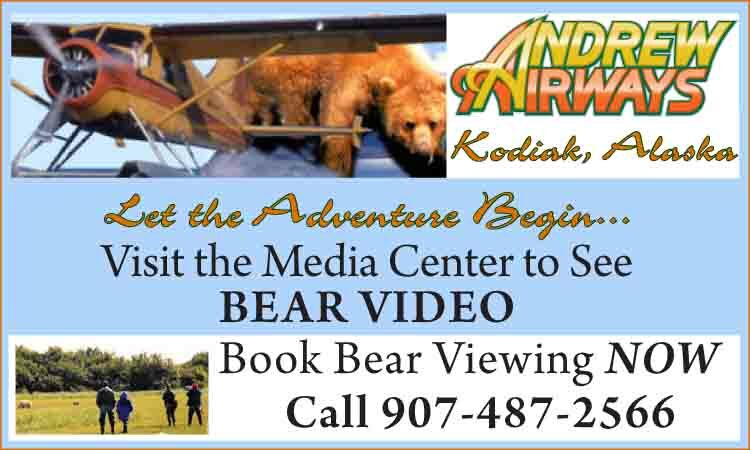 Wrangell-St. Elias Tours provides direct van transportation from Anchorage May to September. Flying into McCarthy is an amazing option allowing you to sightsee massive expanses of mountains and glaciers. Wrangell Mountain Air has regular scheduled flights from Chitina three times a day. You can arrange charters and bush-plane flights from Glennallen, Anchorage or Fairbanks. There is also a twice-weekly mail plane from Anchorage. If you have your own private plane, you can land at the McCarthy airfield. McCarthy is built on a patented homestead, the location of which may have anticipated where the railroad would have to cross the Kennicott Glacier face. It is unclear just how much real homesteading went on, as the railroad soon came to town and McCarthy became a primary freight and passenger drop. The original settlement of Blackburn was more a tent city of hopeful workers than a town, and even though Blackburn organized itself before McCarthy with a council, mayor and school, it was not ideally located for the railroads’ needs and very little of it still remains. However, McCarthy eventually did become the mining support town, all because of founder John Barrett’s political and social acumen. McCarthy’s location ensured its growth over the next decade as gold strikes and other mining enterprises arose in the Sushanna and Dan Creek area. The merchants of McCarthy were known as shrewd businessmen and often got the better portion of the miners’ cash. Just about anything a person desired was available in McCarthy providing one was willing to pay. From female companionship to caviar, anything could be had for a price. Because everyone had to pass through McCarthy, it was a great location for a sin city and the good time girls arrived to set up shop. This continued right up to the final days before the railroad pulled out, though on a lesser scale. Many of the women of the line were highly respected in the community and known for their charity work and good deeds. It’s interesting to note that no church was ever established in the early days within the precincts of the town and though many citizens were teetotalers, the bootlegging and still operations remained rampant all through the prohibition years. McCarthy didn’t truly become a ghost town after Kennecott Mining Corporation and the railroad shut down. There has been a continuous (albeit very small) number of rugged individuals who enjoy life in these mountains. Many mining operations also tried their hand in the area after 1938. Being in the wilderness does not mean going without. Historically McCarthy was a mercantile town and today there are many services available for guests. The town offers a heart felt community atmosphere with local nightlife, historic hotels, restaurants and shops. The unique, locally focused hardware and grocery store features prices that are less expensive than in Valdez or Glennallen! Guests at the McCarthy Lodge are housed in the historic Ma Johnson Building, a fully restored living museum. Evidencing a serious foodie approach to original Alaskan delicacies, McCarthy Lodge’s chef creates superb celebrations of organic fresh produce and forest mushrooms, locally farmed duck, pork and eggs, and wild caught Copper River red salmon, halibut and black cod. For budget travelers, Lancaster’s Backpacker Hotel offers less expensive accommodations in a newly renovated hostel style building with simple, private rooms. Lancaster’s is located in the Jim Edwards historic home and is named after another former tenant, Slim Lancaster – two of McCarthy’s long line of well-known characters. Open from June 1st to September 10th each year, the hotel can store unneeded baggage for visitors traveling on to spectacular backcountry destinations. There are also cabins and campgrounds in the Park, but all are located at least a mile from McCarthy. The engineering effort at the turn of the century to develop Kennecott’s mines and a railroad to transport ore across mountains, raging rivers and moving glaciers was unprecedented. 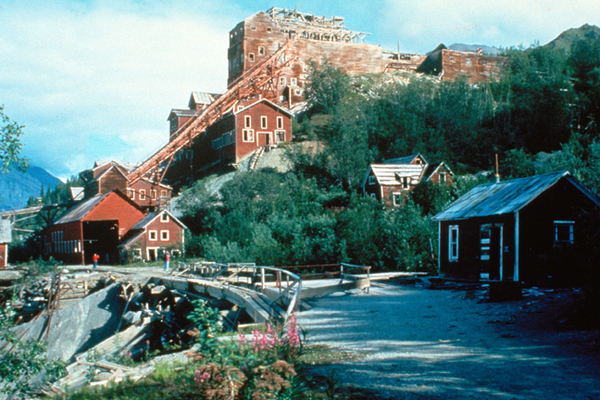 The structures that stand at the mill site and mines represent a time of wide-open exploration and exploitation in Alaska’s rough and wild early days. At 14 levels, the mill building is still the tallest wooden structure in America. An entire steamship was hauled in pieces from Valdez and reassembled on the Copper River. Kennecott’s high-grade copper ore was utilized by the Ahtna native tribes and it was directly because of their knowledge that white men located these copper deposits, among the richest ever found. The Ahtnas had been successful in keeping the Russians out of the Copper River valley and their culture intact, at least until the advent of the Gold Rush. The Havemayers eventually formed the “Alaska Syndicate” with J.P. Morgan and the Guggenheim family, to build the mines, mill works and railroad. The corporation constructed 196 miles of railroad from Kennecott to the port of Cordova, and also maintained a steamship line to transport ore to Tacoma, Washington for processing. Between 1911 and 1938 when operations ceased, over $200 million worth of copper was shipped on the Copper River & Northwestern Railroad. It is said all construction costs were covered by gold and silver recovered from the same deposits, making the sales from copper pure profit. By 1915, when the enterprise was renamed the Kennecott Copper Corporation, the company was well on the way to becoming a multinational giant. Kennecott Copper Corporation employed over 600 people. About half worked at the mill site where crushing, sorting and shipment occurred, and another 300 lived up the mountain at the mines, reached by an extensive tram system. There are over 80 miles of tunnel honeycombing the mountain. Kennecott was a self-contained company town, complete with power plant, homes for the managers, modern hospital, company general store, gymnasium, schoolhouse, recreation facilities, bunkhouses and its own Kennecott Dairy. Some of the buildings in Kennecott are still owned privately and several McCarthy vendors are located there. With the acquisition of the site by the National Park Service in 1997, many buildings have been restored using locals for the construction crews. The Park Service continues to spend millions to preserve this endangered national monument. There are local guiding companies that currently conduct tours through many of the buildings. * Kennicott is the correct spelling for the glacier and Kennecott the correct spelling for the mining company and mill site. Today either way may be considered correct. This is a very popular route with locals and hikers, but not very well advertised. You will meet other hikers most likely. Great views, rough terrain, lots of water, good camping. Some bears so be prepared. Approximately 15 miles but you can go as far as you want, making this a great day hike. This hike starts at Kennecott Mill Site. There is a ranger station at the entrance to Kennecott ‐ report in. Camping is allowed along this route. It is a very nice day hike of 4-7 miles for the whole family. Lots of fresh water. Bears possible so be prepared. Ground squirrels in this area. Nice views but better on route 1 above. Hikes up McCarthy Creek may require you to cross the creek several times. For much of the year this is no problem as it is a shallow creek. Check with the locals to find out the condition of this creek as many of them must cross it each day to and from home. Take route 4 up the creek and keep following the creek and road. There are several tunnels hewn through the rock face on this route. There is private property along this trail so please be respectful. You can make this trail a day hike or camp over. Approximately 13 miles possible. Starting in McCarthy follow the creek and old road and then branch off at Nikolai Creek and go up and over the Kikolai Pass to the Nizina River Valley. This historic freight route was much used at the turn of the last century to access the gold rush area of Chisana or Shushanna and several other mountain passes used to traverse early Alaska. Nikolai Creek is named after the powerful Athabascan Chief whose domain spread into this area and played an important part in the early history of the mining district. 17-20 miles to the Nizina. Definitely a 2-3 day hike, some steep ascents and descents. McCarthy Creek is a great day hike and picnic area. Only about 4 miles long, this trail is easy to follow for the first half and then gets steep. As long as you are heading uphill there is no way to get lost. The last half is very steep but the panorama is great. If you get high enough you can check out the remains of an old mine located near the end of a rocky chute. You must be in good shape to complete this hike in one day. Horses used to carry supplies up this route to the mine site. This is a State road and an easy hike. May Creek and Dan Creek were a very important mining area in existence before McCarthy or Kennecott. The first phone system went in between McCarthy and Dan Creek. The end of your hike is rewarded by the incredible sight of the Nizina Bridge, which speaks to the importance that early Territorial government placed on this area and the dollar wealth it produced. The road is about 12 miles in length with many homesteads scattered along the way. Great day hike for the family or take several days. Cross over McCarthy Creek in McCarthy then down the Kennicott for up to 4 miles. A delightful hike that is easy and filled with all kinds of surprises and magical sights. You can retrace your steps or you can hike a short distance through the woods and walk back on the Nizina road. Hard to lose your way on this hike with the river on one side and the road on the other. Great day hike for the family with plenty of places for kids to get wet and go picnicking. Starting at the same place as route 5, this is a much easier hike and will take you by beaver lodges, old wood cutting trails and horse freight packing trails. The forest is often open and one can view the activities of the forest and explore outcroppings and plants in different habitats. Nice day hike with the family or alone. Approximately 3 miles. Walk from McCarthy towards Kennecott to the Community Center “Tony Zaks”. Opposite Tony Zaks you will see a sign marked “Wagon Trail”. You can take this trail to Kennecott Mill Site if you wish and it’s a good bicycle trail. During the railroad days it was used to carry freight by wagon or motorcar to Kennecott. When the trail forms a Y go to the left and this will take you to the glacial moraine and dry river channels. Locals used to gather ice here in recent years. This is a very fun area for kids and adults alike. Follow the dry channels down river and you will end up near the footbridges near where you entered McCarthy. 2 to 4.5 miles depending on which way you choose to go. Great day or evening hike with the family or alone. You can spend endless hours out here exploring the area’s interesting geology.